Let’s look closer now at the Eight Skills, and consider some of their typical specialty practices within the organization, colored in gold below. We will explore the skills and their specialty practices in greater depth in Chapter 5 (The Do Loop) and Chapter 6 (Methods and Frameworks). The first four are foresight skills and practices (strategic foresight), and the second four are action skills and practices. 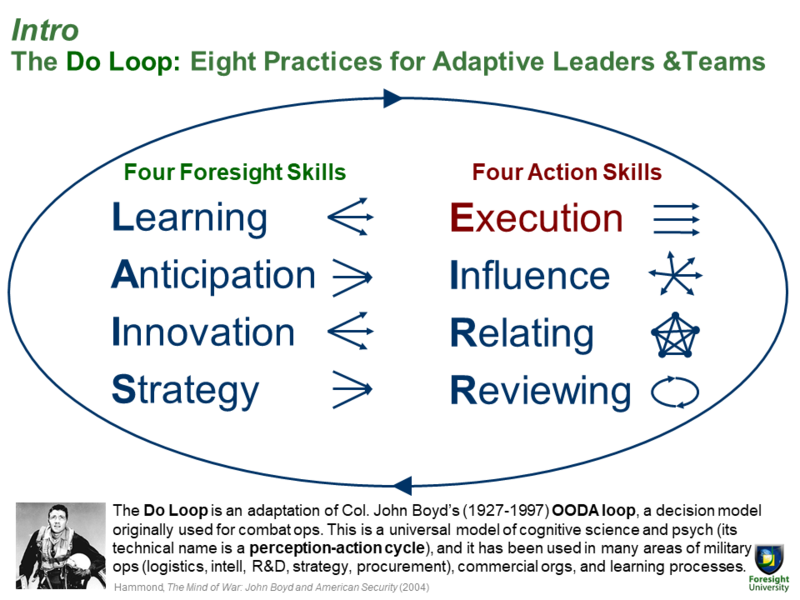 It is only when we use all Eight Skills, in a continual foresight and action loop, that we are practicing adaptive foresight, which we define as foresight that results in successful, adaptive action. Again, the Eight Skills are composed of Four Foresight Skills and Four Action Skills. We will occasionally call the Four Foresight Skills by their acronym, LAIS, which we can remember as the first four letters of the phase “LAISsez faire”, the entrepreneurial freedom that enabled capitalism and the industrial revolution. We can remember the EIRR acronym by recognizing it also stands for the Economic Internal Rate of Return, a measure that helps social planners understand the full cost or benefit of a project to the economy. Alternatively, you may like the phrase “Love, AI, Self-Empowerment, and Internal Rate of Return” as key factors in the 21st century that will work together to create adaptive foresight for society, for organizations, and our personal lives. The Eight Skills, as they are derived from cognitive science, seem directly applicable to each of the first three (Personal, Organizational, and Global-Societal) of the POGU foresight domains. The specialties apply to all three domains as well, though less precisely. While the titles of the twenty specialties are taken from the literature of Organizational foresight, consider that versions of them apply to the domains of Personal and Global-Societal foresight as well. For example, an individual who uses an online behavior-monitoring platform as part of their exercise regimen (Fitbit, Strava, etc.) is engaged in Accounting & Intangibles and Intelligence & Knowledge Management (both Learning specialty practices) and the platform and individual are using Data Science & Machine Learning and Forecasting & Prediction (Anticipation practices) to understand and motivate the user. The platform and individual are also doing Analysis (a Strategy practice), Performance Management (a Relating practice) and Auditing (a Reviewing Practice). Successful individuals must also engage in continual Project Management, Sell and Market their ideas for next actions, take care of themselves and their relationships (Human Resources), and engage in the rest of the foresight practice specialties on a regular basis. It is easy to argue that societies must do all of these things as well, to be long-term successful. So while the names and total number of our twenty specialties will surely be somewhat different when we derive them for Personal and Global-Societal foresight, they are at least a useful place to start in those domains as well, until we develop better models. Below is another graphical version of the Do Loop, split into the Four Foresight Skills and the Four Action Skills, with graphical representations next to each skill to show the kind of thinking (divergent, convergent, redivergent, reconvergent, translational, radiative, integrative, and cyclical) that is the primary thinking mode of each skill. We’ll explore these Eight Skills in more depth in coming chapters. In my view, they are the most critical practices for adaptive leaders and teams. 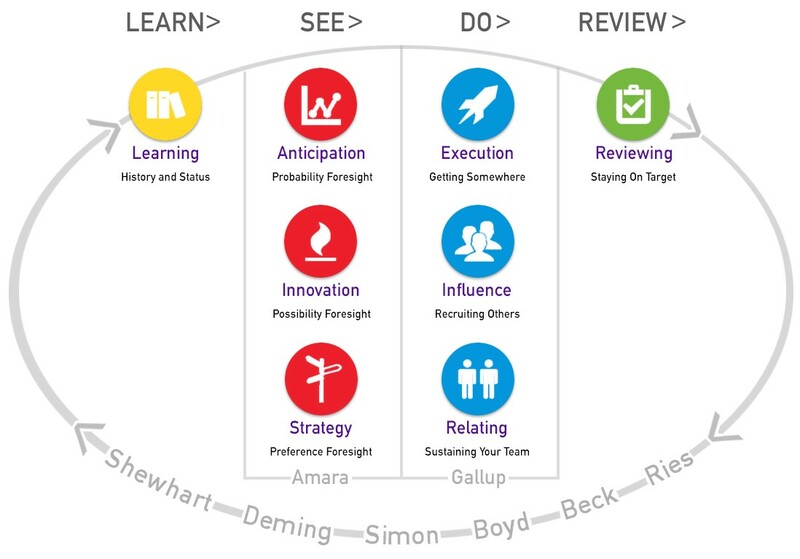 Learning (understanding the relevant past and present) is a critical step in foresight preparation, and the three skills in blue, green, and purple above (Skills 2, 3, and 4) are the three main types of foresight production. Foresight output is most fundamentally always about either predicting-protecting, creating-imagining, or strategizing-planning (“leading, managing”) (seeking probable, possible, and preferable futures). Each of these activities can at times be in competition with the others in the organization. Of course, foresight without action is useless. We need to execute our strategies, influence others, build relationships with our teams and clients, and review our work. Good foresight professionals must use all Eight Skills personally and on their teams, to keep their organizations adaptive. We also use them in a continual cycle, which we call the Do loop. Using all eight skills consciously and well is level of mastery that many practitioners still need to achieve. We can now offer a second, more specific definition of a foresight professional: anyone who self-identifies as commonly using at least two of the four foresight skills (Learning, Anticipation, Innovation, and Strategy), and at least one of the four action skills, for an organization or client, for the majority of their work week. This seems a good starter definition, at a time when many foresight practitioners don’t yet understand all the skills that strategic and adaptive foresight actually encompass. Again, we propose that foresight professionals must use and be at least minimally proficient in all Eight Skills in order to be adaptive, to do useful and effective work. We need to realize all the key skills we need to be successful, and ask ourselves if we are using them all well. Often, we aren’t. 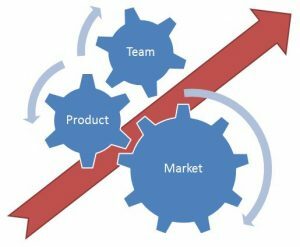 Some futurists would consider Skills 5, 6, and 7, the traditional Product, Market, and Team functions in an organization, to be outside the scope of our profession. But that would be an oversight, as every foresight professional, even if they are a sole practitioner, must execute good work (our Product or Service), must have influence on our clients (our Market), and must relate to, motivate and treat ourselves, our coworkers and our professional colleagues well (our Team). We must also continually review our work, if we wish to make it better. Both we and our clients need strong expertise in the Four Action Skills for our work to be an effective and adaptive activity. Many foresighters overlook these last four skills, and their impact suffers. Other foresight practitioners might consider specialty practices like Learning & Development, Intelligence, Ideation, Innovation, Entrepreneurship, Design, Risk Management, Strategy, Planning, Benchmarking, Quality, and Change Management to be outside the boundaries of our profession. Again, that would be an oversight, as these are all critical ways that good firms presently negotiate the future. Ignoring them just puts us out of touch with the most popular foresight functions being used today, and less able to help our clients. Our narrowness of vision regarding the scope of foresight is historically understandable, given our field’s youth and its current lack of strong theoretical grounding. But the danger of such parochial perspectives is that they relegate foresight to an ineffectual corner of organizational practice, rather than recognizing it for the universal that it is, the set of all the best tools and methods we presently use in our thinking and actions toward the future. Sadly, the field of professional foresight is so underdeveloped today that a few foresight professionals even argue, in writing, that forecasting and prediction skills are not a part of our profession! Exposing this dated view as both incorrect and damaging to our field, is one of several reasons I decided to write this Guide. Prediction may not interest some of us as individuals, but probabilistic thinking is one of the three core future thinking types in our profession. I’ve used the word “predicting” in the subtitle of this Guide, as a stand-in for the Anticipation skill, to challenge the widespread societal and professional bias that the future can’t and shouldn’t be predicted. If we neglect any of the Three Ps, our foresight thinking is unstable, and incomplete. A tripod is a stable structure, and it requires all three legs to be strong and well-built. This Guide will help you apply Three Ps thinking, the Four Foresight Skills, and the Four Action Skills better than any other you might read on foresight practice today. You will need to use and balance all Eight Skills to build a maximally effective and inclusive foresight practice. Better Wording? References? Data? Images? Quotes? Mistakes? Thanks for helping us make the Guide the best intro to foresight on the web. Foresight University (4U) is a professional learning and development company, run by academically-trained foresight practitioners, entrepreneurs, technologists, and creatives. We offer high-quality training in personal, organizational, global, and universal (POGU) foresight and leadership, help leaders and entrepreneurs maximize their positive impact, and support the growing global foresight community. See Further. Work Better. Thrive More. You and the universe are amazing! Why Think About The Future? What is the Foresight Field? How Large is Our Community? What Do We Call Ourselves? V. What Will Your Contribution Be? Career Planning: Where Will You Go Next? Transcension Hypothesis: Where Acceleratn Ends? Seeing It All: Accel., Diverg, Adapt, Convrg, Decel. 3. Political Agents : Activism & Represent. Next Government: PAIs, Groupnets, Democ. What Will Your PAI Contribution Be? What Will Your Empowerment Contribution Be? Life is Amazing; Spread the Word!